This post is about the process I went through while joining my first partnership. One thing many pilots do to reduce the cost of flying is to join forces with other fellow pilots. This is known as a partnership or a flying club, and it’s the road I decided to take a few years ago. Let me start with a short disclaimer: I actually don’t own an airplane (or even a share of an airplane). what I do own is a share of a not-for-profit corporation that owns an airplane. That share ownership allows me to use the aircraft at cost.When I was finally ready to make the big jump from renting to owning a share of an airplane, I started looking around. There are plenty of places you can find a very expensive toy, but because I was looking at something local, the easiest strategy, at least early on, was to check the board at the Rockcliffe Flying Club. I also talked to a few people I knew at the club. I started by documenting what to look for and how the process might roll out. There are a few books available on the subject. While most of them are written for US pilots (including ASA’s Buying and Owning Your Own Airplane), they still provide a good overview for aviators who don’t live there. As you read and learn, you need to start defining your “mission” and get some idea of what you can afford. As you can imagine, there are many options available so, if you don’t set goals—and constraints—it will be difficult to find a place to land. In my case, I wanted a plane that would allow me to go to places with my family of three (plus luggage), and fly using Instrument Flight Rules (IFR). In the end, there were a number of questions I didn’t cover but, if you are interested and want to create your own check list, have a look at my full document in Microsoft Word format. Some think a pre-purchase check is unnecessary because other partners will still be there but I believe it is critical. At the very least, you should discuss this with other partners (realizing, of course, that they have a vested interest in you joining them). Personally, I would consider the comment that a pre-purchase inspection is not needed as a warning sign. The part of the process that can be helpful as a basis for lengthy discussions—and might serve as a somewhat dubious justification for your spouse—is the cost calculation. I have a tendency to analyze numbers using a spreadsheet, clearly a side effect of my day job. I looked around for an existing template and was able to find a few that focus on the creation of a partnership. A good one is on the Aircraft Owners and Pilots Association’s web site). I wasn’t able to find one, however, that would allow me to analyze joining an existing partnership. 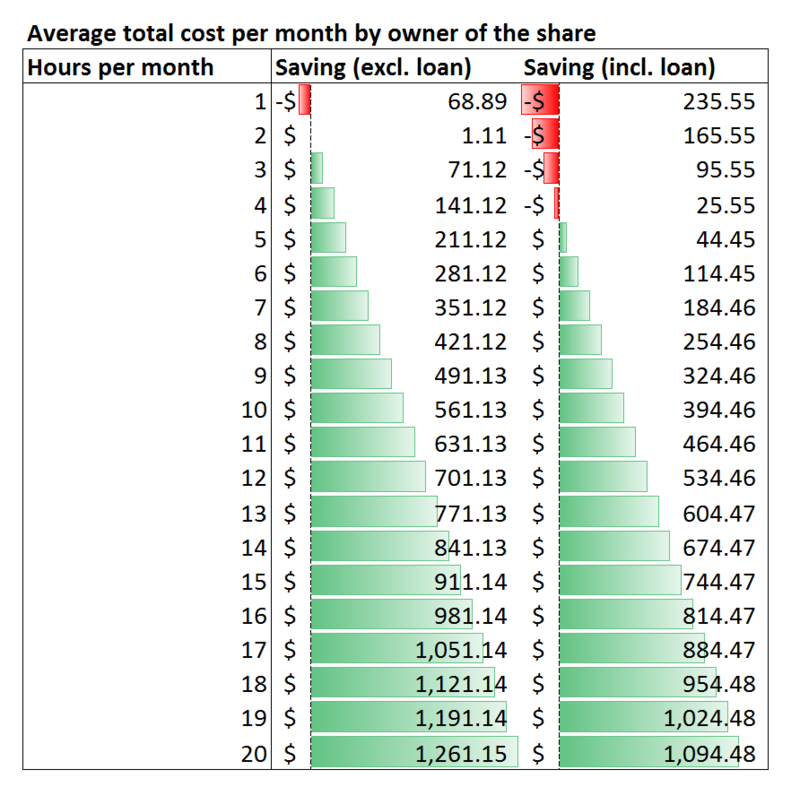 It’s easy enough to create such a spreadsheet using the initial cost-per-share and the number of partners. Then, when you add the different shared costs such as insurance, tie-down, annual inspection, maps, etc., you start to get a pretty good picture of renting versus owning. the plane uses nine gallons of fuel per hour. In other words, while I can’t guarantee the numbers, it appears that if you fly over five hours per month for the first six years, you will be better off owning a share than renting a plane. Year seven and beyond, you will be better off owning only if you fly at least 2.5 hours per month. One thing to keep in mind is that this model looks only at expected costs. As an owner, you are also responsible for all the surprises that crop up from time to time—and let me tell you, they do crop up. But remember, I have also not taken into account the advantage of being able to fly somewhere for a week’s holidays in the summer and leave the plane at the destination airport. Here’s the whole spreadsheet if you want to plug in your own numbers to find out for yourself how things look. Yes, it’s costly. But the feeling you get when you are handed the keys to your own plane? Priceless.